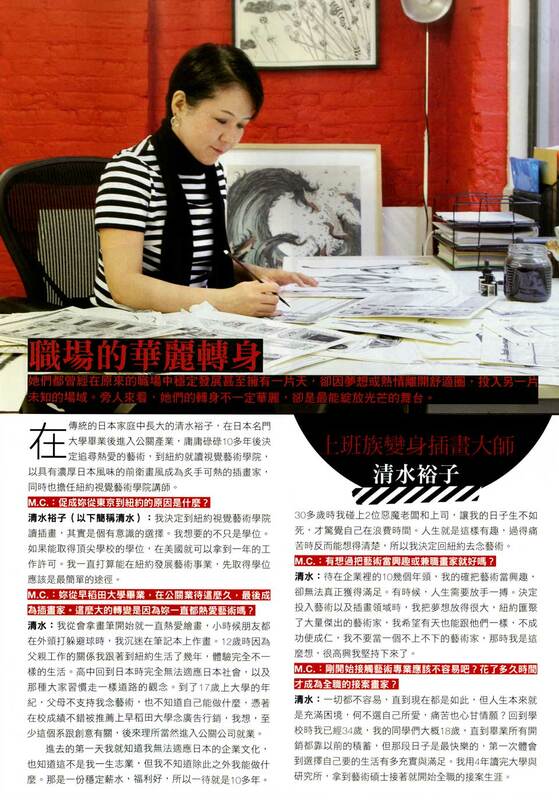 Marie Claire Taiwan asked me about career change from corporate to art. What I want you to know before pursuing your dream career. 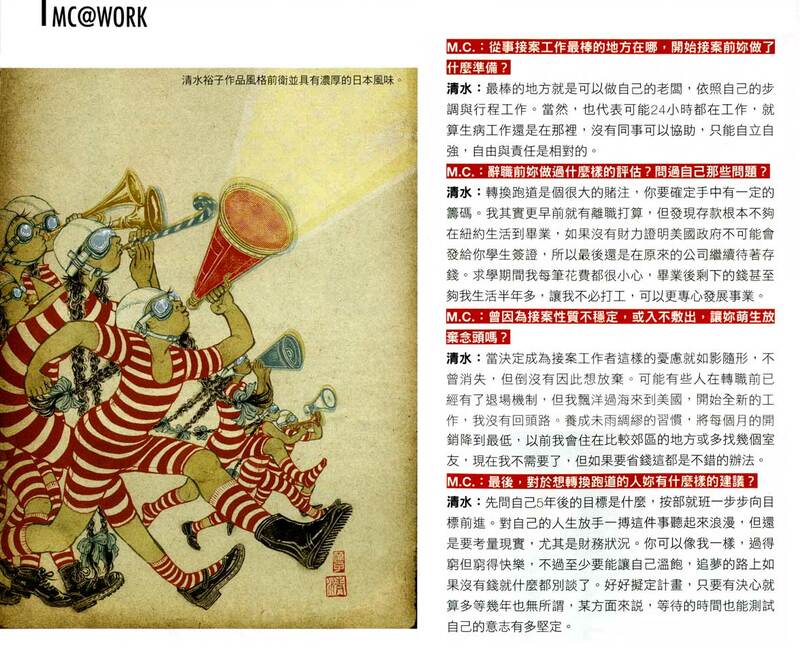 June issue of Marie Claire Taiwan June 2015 issue had a feature article where four women in different career paths were interviewed for our career changes, and to give advise to those who aims for the same. I am happy to be chosen as one of the four. Below is the original correspondence I had with Jasper Hsu, feature editor of MC. Since I get asked about this career change often, I thought it was a nice opportunity to share my thoughts. Hope this is useful to some of you. If you wish to read the original Traditional Chinese edition, please click on the image to enlarge. Could you briefly introduce your background, and what made you move from Japan to New York? I moved from Japan to New York to attend School of Visual Arts to study illustration. Also, it was a conscious move to get work permit in the USA. In the US, by receiving a higher degree from an accredited universities, the government grant one year work permit to international students. I wanted to move to New York as much as I wanted to be an artist, so going to school here was the easiest (not so easy though) way to move to NY. You graduated from one of the top universities in Japan, came from a PR background, then become an illustrator. That was quite a leap, how did that all happen? Did you always know you had passions for art? I always loved drawing, ever since I was old enough to hold a crayon. It was always my hobby. One of those kids, when it is sunny and nice out, and almost all your classmates from elementary school are outside after lunch playing dodge ball, there are always like 3-4 kids who stay inside and draws in their notebooks. That was definitely me. When I was 12, my father’s job moved our family to New York, and I lived here for four years during middle school. I went back when I was starting high school. But with completely different life experiences in the US, I had difficult time adjusting back to ’orderly’ life in Japan. I felt I was never accepted back in as ‘one of us’ from very homogenous Japanese society. That was an ongoing struggle since the day I went back to Japan until when I finally came back to New York. My parents were not so crazy about the idea of me going to art school (they think of Van Gough when they think of working artists), and I was also not so sure about what exactly I wanted to do with life (I was like 17 after all). So I ended up going to a regular university. I got really good grades in high school, so I got accepted into a good university on recommendation, thus avoiding notorious Japanese college entrance exam system. I studied advertising and marketing in college, because I thought it was the most creative of the practical field. I still wanted to do something creative after all. And it was kind of a no brainer set path to get a job in corporate PR with that background from college. When I turned age 30, I started think, REALLY think. Think that I shouldn’t just waste my life like this. But I didn’t have a concrete plan. Around then, I got a really really mentally abusive bosses. Not A boss, but TWO bosses. They made my working life HELL. Funny thing is, when you hit the rock bottom, you really see things clearly. Sometimes, rock bottom is important because of that. (Though, I hope to never hit it again, and I never with it upon anyone.) That was when I realized I should pursue more meaningful life. You only live once, and you can’t really waste time like this! So, that’s when I made up my mind to 1) study art 2) move to New York. Instead of becoming a full-time artist, have you thought about keeping your old job and working as an artist on the side or making it just a hobby? That’s kind of what I did when I was working for 11 years, and it was clearly not working out. Sometimes in life, you need to bid on a big gamble. Also, when I decided I really wanted to pursue art and illustration, my goal was to aim for a small fish in the big pond, the biggest pond (New York). Where you are surrounded by most inspiring people you would look up to, and with a possibility that one day you can may be grow to be a big fish in that pond just like them. Go big or go home. No in between. I’m glad I did that. Did you experience any struggles when you first started studying art? How long did it take for you to become a full-time freelance illustrator? Nothing is easy. Every day is a struggle, even now. But the life is full of struggles, so why not struggle in the life you love to live? I went back to undergraduate first year, so I was 34, and all my classmates were around 18. Though it was struggle, and I was poor living off of savings till I finished school, it was also one of the best times. I was, for the first time, living a life that I had chosen, and the chosen path was hard, but meaningful. After I finished the second year in undergraduate, I switched to two year master’s program in Illustration from the same school (School of Visual Arts). Total of 4 years, and I graduated with MFA degree, and I pretty much started working full time freelance illustrator right out of school. What’s the best and worst part of being a freelance illustrator? What does one have to prepare or have before plunging in? That you are your own boss. You can work on your own pace and schedule. But of course, that means, you may be working ALL THE TIME. Also, if you get sick, your job is still there. Nobody can cover for you. You have to cover everything for yourself. Freedom and responsibility come hand in hand. Before you quit your old job and pursue new career, did you evaluate your financial status? Like how long you can support yourself with the money you had, etc.? What questions did you ask yourself? Definitely. You need to take some gambles in life, but you also have to have enough chips on your table to play the game. I initially wanted to leave a few years earlier than I actually did, but I realized I didn’t have enough money in my bank account to support myself through four years of school and living expenses in NY. So, I ended up sticking around with my old job for a few more years to save up enough. US government won’t issue you a student visa unless you have a proof of bank balance to cover the number of years of study (tuition + living expenses), so there was no choice. It was hard extra years, but it worked out in a long run. I was very careful with spending, and when I graduated, I still had just enough money in my bank account to pay bills for extra six months or so. That helped me focus on getting my new career on track without getting another day job. In the end, that extra few years of wait was actually a wise move. Did you have a time where you struggled the most trying to make ends meet or having no clients, not knowing where your next income was? Did you think about giving up? The worries, about your career or life, would never go away. At the end of the day, you are always a freelancer, whether you are starting out, or you have 10+ years of experience. Your career and income depends on each job and each project that comes on your way. So, yes, some kind of worries always linger. But I don’t think I ever wanted to quit. I may be in a different position from other people who are interviewed. I moved across the ocean to a foreign country to pursue a different career. Not that I had a back up plan if I quit. I didn’t. So, where do I go if I quit? You have to be very responsible and good about putting money aside, always have some extra money in the saving account for the rainy days, and especially in the beginning, keep your monthly bills as low as possible. Knowing the monthly bills are not expensive is a huge weight off your shoulders. I lived far out from the city center, I lived with multiple roommates. I was able to survive off of not much in the beginning. I don’t want to go back to those early days, but it definitely was a wise choice till my career was on the right track, and was able to afford a small apartment on my own in the city. What advice can you give to those who want to leave their current jobs and pursue something more inspiring? In what situations would you advise against it? Have a really clear goal where you want to be in five years, and based on that plan, work out each year accordingly in steps toward reaching there. It’s beautiful to take a big leap of faith in your life, that big gamble of your lifetime, but even that big gamble should be based on some kind of realistic view, especially financial reality. You may be happy to be really poor while pursuing your dream like I did, at the same time, you can’t run out of the money while you are working toward the goal. Make a really good game plan, even if it means waiting for extra few years to pursue it. If you are really committed to make that life change, you will do it even after that extra time of wait. In a way, that’s how your commitment gets tested.